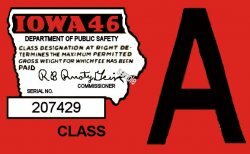 1946 Iowa Tax/Inspection sticker - $20.00 : Bob Hoyts Classic Inspection Stickers, Add a Final Touch to your Restoration! This 1946 Iowa registration sticker validated the 1945 Iowa license registration. It also passed inspection which was required to obtain registration.